The right concealed carry jacket should be functional and comfortable, while also maintaining an element of style suited to your unique taste. Since this piece of outerwear should last you many years, it’s important to take your time as you shop for the right jacket. Here are a few tips to bear in mind to help you get the most from your purchase. The right jacket will get you through a variety of weather patterns, offering just the right amount of warmth on chilly days without causing you to overheat. For the greatest level of versatility, choose a zip-up style that can be layered easily. One of the purposes of concealed carry ready outerwear is to provide accessibility to your firearm. For this reason, the pocket should simplify retrieval without running the risk of having your handgun fall out. Look for security features like an elastic strap to safeguard your weapon without impeding ease of reach. To withstand long days at the shooting range and inclement weather, your jacket should feature durable materials. Look for USA-made products and materials featuring properties such as wind resistance and moisture-wicking layers. Tried-and-true textiles like fleece, denim, corduroy, or leather will hold up to rigorous use. Many pieces of outerwear compromise mobility in exchange for warmth. A good concealed carry jacket should provide both. You should be able to move your arms freely and maintain a complete range of motion for firing your weapon, so make sure the jacket is comfortable and not too stiff. While the overall style of the jacket is a matter of personal preference, one important universal trait all concealed carry jackets should have is, naturally, concealment. The garment should be able to accommodate your compact or sub-compact handgun discreetly, so take a look in the mirror before heading out and carrying. 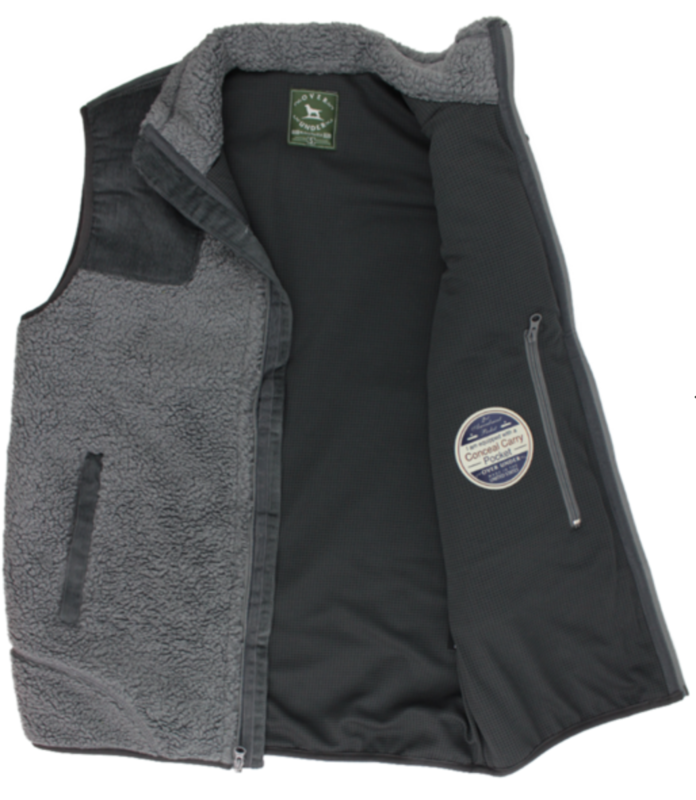 If you’re shopping for a concealed carry jacket that will get you through any weather comfortably and stand up to many seasons at the range, consider the King’s Canyon Vest from Over Under Clothing. Their online store ships nationwide and proudly offers all USA-made men’s clothing, including outerwear and accessories. Shop their concealed carry line on their website or call (904) 619-0577 to speak with an associate.